Kristopher London is 25 years old, lives in a big house with all his buds, his girlfriend, and (at least) three dogs, and makes good money by, well, filming himself in his big house hanging with all of his buds, his girlfriend, and the dogs. London is a self-described “YouTuber,” or a “New Media Consultant” when he’s feeling fancy. He’s a guy who creates video content about his life and then puts it on YouTube dot com where his approximately two million loyal fans watch. More recently, London has also become a “Twitch Streamer,” which means he records himself playing video games. He makes money doing this, too. 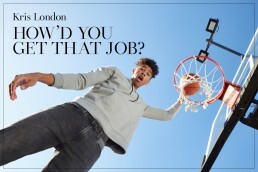 Basically, London has figured out how to make money by just being himself in front of more than two million people. The trick of course, is that he’s not really being himself. In person, London moves deliberately and talks slow. 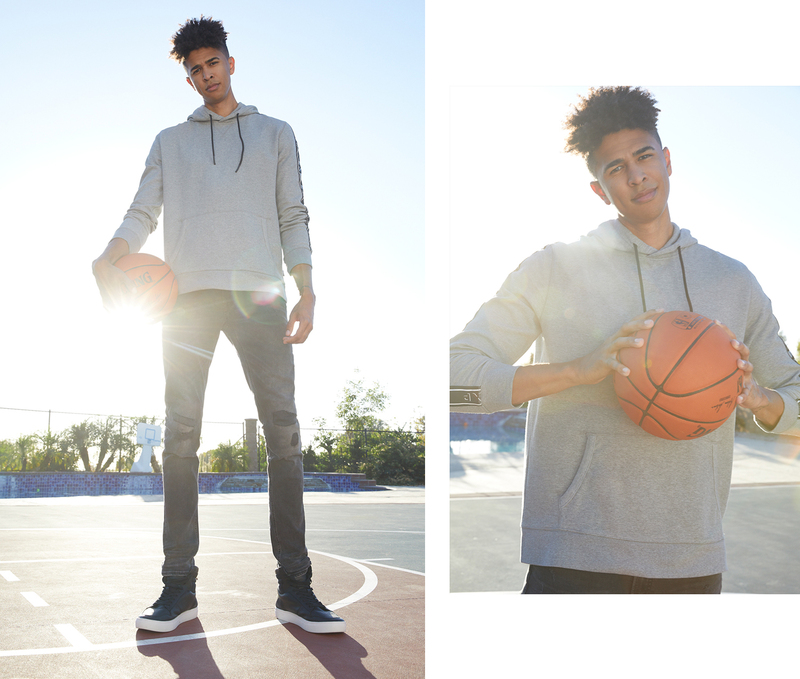 His voice is low and deep, and his 6-foot 10-inch frame—he’s a shockingly tall former college basketball player—unfolds from chairs, sofas, and cars like molasses, there’s no rush in him. On camera, his voice rises an octave or two (especially when he delivers his signature greeting, “Mooshi, mooshi peeps!”), and his videos are edited in such a way that everything feels like it’s moving at warp speed. It’s a really good magic trick, and one that this internet personality has spent the last five-ish years perfecting. 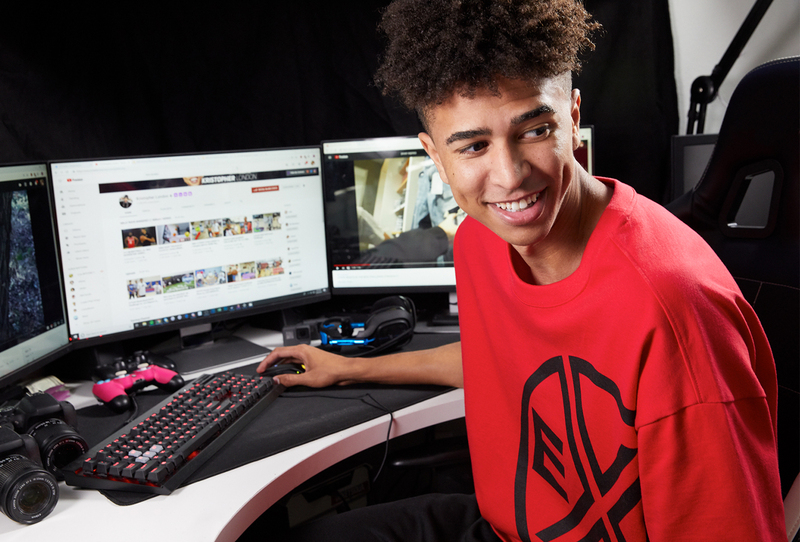 So, in advance of the Express’s NBA2k19 Twitch livestream in San Francisco, we visited London in his West Coast mansion—dubbed the 2Hype house—to learn all about what it takes to become a streaming sensation with millions of followers. 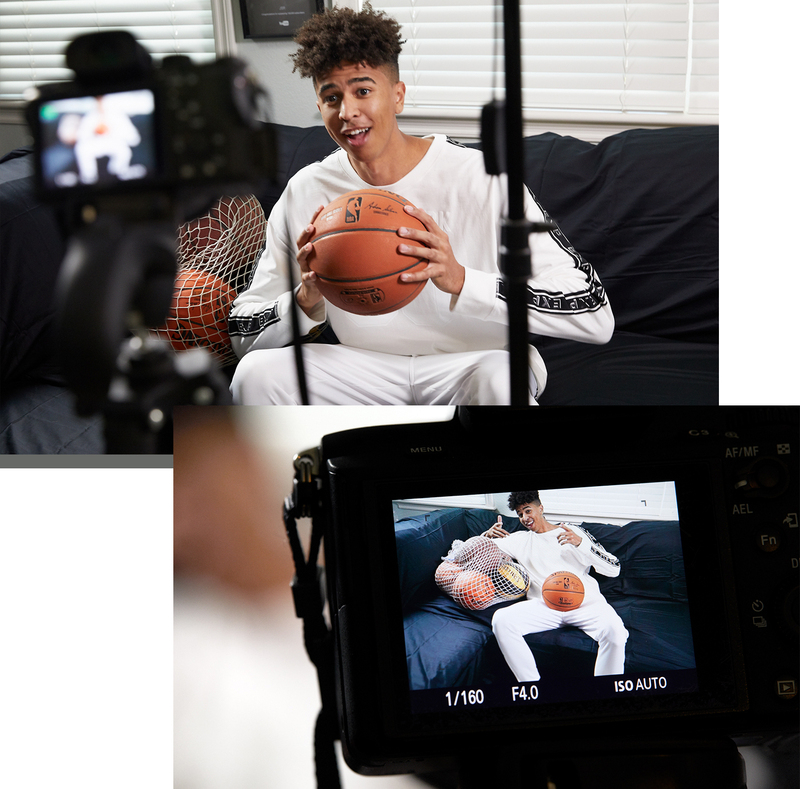 We also had the former college basketball player take our new Brand that Unites collection for a spin on his personal basketball court, tested it out in the streaming seat, and even took a bomber jacket for a ride in a Porsche. See below for a starter kit to Youtube stardom and pics from the epic shoot. How old were you when you started making videos? How did you get into it? I always liked making videos. In high school, I started with animation—just stick figure animation—I loved drawing and creating videos and then I discovered YouTube. During my freshman year in college, I realized I could make a career out of it. But I didn’t start taking YouTube seriously until I dropped out of college in my junior year. At which point did it become a job for you? I started making enough money to support myself when I dropped out. I got a job as a tailor and suit sales associate at a menswear store and was doing YouTube just to maintain financially. And I was living with my parents. But I treated it like my full-time job. I was writing every day, making content every day, uploading every day. I wanted to be known as more than just a basketball player. I didn’t even look at a basketball when I first stopped playing for a year or two, and I didn’t upload any basketball-related content. It was all comedy. I used to write skits and try to make people laugh. At the time, my dad was very hard on me. But for good reason. He wants what’s best and wanted me to have a plan. Once I proved that I had one, and that I was making money as well, he was cool. So, I think it became a job when I was 20 or 21 years old. How long were you making videos before you started making money? I was doing it for a year. But once I got a viral video I was like OK, now it’s time to really try. Was it important for you to try to find a niche? I was trying to find a niche, but I was also catering to what was popular so I could get the viewership that I needed. Once I had the viewership, that’s when I created my own niche. For example, I know when a celebrity messes up or something I’m going to talk about it. I would always talk about trending topics just to put my two cents in because that’s what people like and want to see. Then once I built a viewership around that I started to express my personality. I slowly started to put out my own stuff, like skits that I wrote and basketball content. It was just me being myself and blogging my daily life. If I had started out doing daily vlogs, it wouldn’t have made sense because they didn’t know who I was so why would they care what I’m doing on a day-to-day basis? What were some hard lessons you had to learn along the way? When you’re an Internet personality, you can get lost in reality. When you’re so focused on trying to be a people pleaser you’ve got to remind yourself that you can’t please everybody. I would spend hours editing videos and just trying to do everything and also work out. But I didn’t have like enough energy to do all of the above. I learned that I have to have a balance with everyday life and then video life, and it just got so unhealthy that I had to go to the hospital. It was bad. And that kind of just woke me up to like you know prioritize health over fans. Trial and error. I think it’s okay to fail. And I’ve done that. I realized I couldn’t do everything myself. It’s impossible for me to edit every single video. It’s impossible for me to make every single thumbnail. I can have a team to help me so I’m not so stressed out. It takes some weight off my shoulders. Is that what this house is about? Do you guys support each other? The house was more so we can work together. We started out as friends and then we thought Oh, hey we’re all pursuing the same things so let’s just get a house, make content every day, and help each other grow. We love life and having fun. What about Twitch? Is that different for you? I like playing video games and once I saw gaming was picking up, I started live streaming. There are streamers that are personalities who entertain for hours. For me, the way I stream is the opposite. I’m just being myself. I’m chill, can be soft spoken not to like over the top (unless I rage), and it’s just how I am naturally. I feel like my audience appreciates the live streams more sometimes because they know that’s just me. What advice would you give to someone who wants to follow your path?